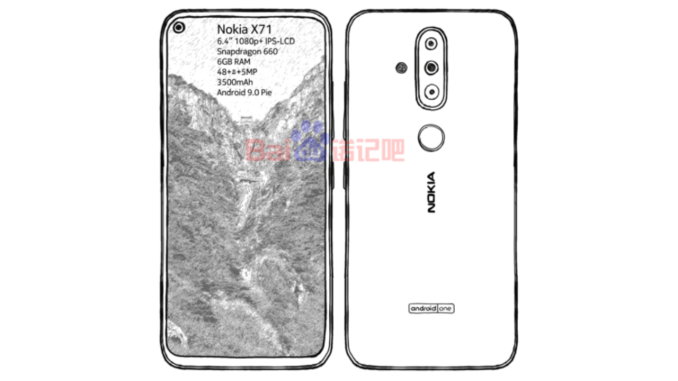 Nokia X71 has been in the leaks from quite a time now and the latest leaks of the same have popped up online. HMD Globals is expected to be launching the device on April 2 along with Nokia 9 PureView in Taiwan. According to a new leaked sketch of the upcoming device comes from a trusted leakster from China which confirms a punch hole display along with a triple camera setup on the rear. Considering earlier rumors, the device said to be known as Nokia 6.2 in few markets but the latest leaks suggest that this is a completely new device. From the image, we can clearly see that there is a triple camera set up on the rear along with a LED flash placed along it and under that we can find a circular fingerprint sensor. We can also Nokia branding just below the fingerprint sensor. The Volume rockers along with the power buttons are placed on the right side of the device. As the handset is a part of Android One family, it should be running on the latest Android 9 Pie operating system. The handset is also confirmed to come with a 3500mAh battery and might support fast charging technology too. On the rear, there is a 48MP camera sensor coupled with an 8MP secondary sensor and a 5MP third camera. Well, are you planning to get this Android One device from HMD? Comment in the section below if you have more queries and stay tuned to Android Advices for more.